Akansha Kumar ’11 (left) and Shubhi Goyal ’12 perform with MIT Chamak, a South Asian fusion dance team, at the ASA Activities Midway last Friday. More than 200 student groups had booths in the Johnson Ice Rink. Many stem cell researchers have been left uncertain about their own future and the future of their field as they wait for a federal judge to decide whether to allow the NIH to fund human embryonic stem cell research, within and without of its walls. 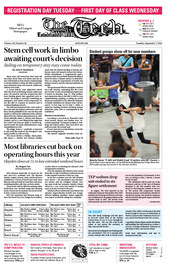 MIT Libraries drastically cut hours for the new 2010-2011 academic year. The libraries Hayden, Barker, Dewey, Lewis, and Rotch lost a combined 27.5 hours of service per week. Most libraries will open half-an-hour later and some, including Hayden, will close an hour earlier. In August, The Tech reported on the settlement between Tau Epsilon Phi (TEP) students and cleanup volunteers over injuries resulting from dropping sodium in the Charles River in 2007. The Boston Globe subsequently reported that the settlement was in the hundreds of thousands of dollars, according to John J. Barton, a lawyer for the victims.